Here at The Fort Wayne Children’s Zoo we have a pair of Wrinkled Hornbills (Aceros corrugatus), Bayu (Bye-you) and Ayu (Aye-you). Bayu, which means “the wind” in Indonesian, is our 16 year old male and Ayu, meaning “beautiful,” is our 13 year old female. You can tell them apart based on their size and coloration; males are larger and have bright yellow and red heads and beaks while the females are smaller and darker in color. 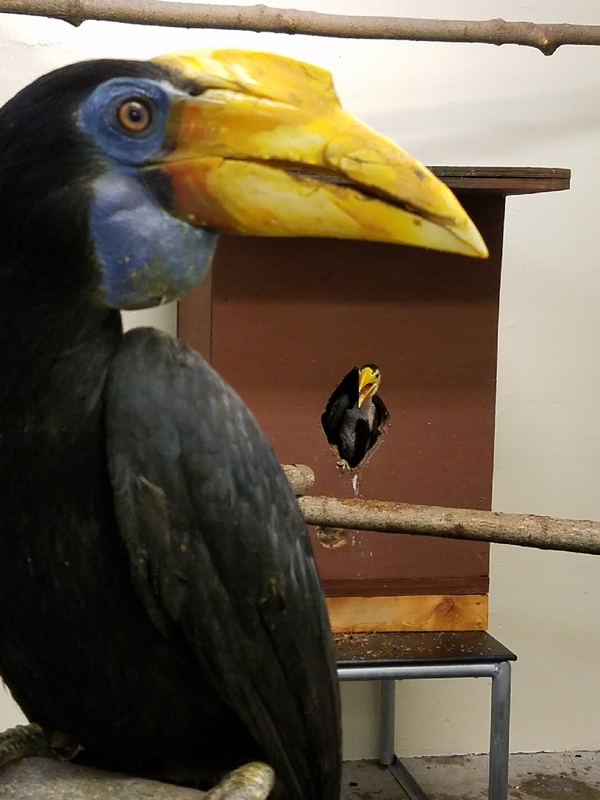 If you visited our Zoo this summer, it might have looked like there was only one bird in the Wrinkled Hornbill exhibit. But fear not; our female, Ayu, had a very busy summer sealing herself into her nest box. 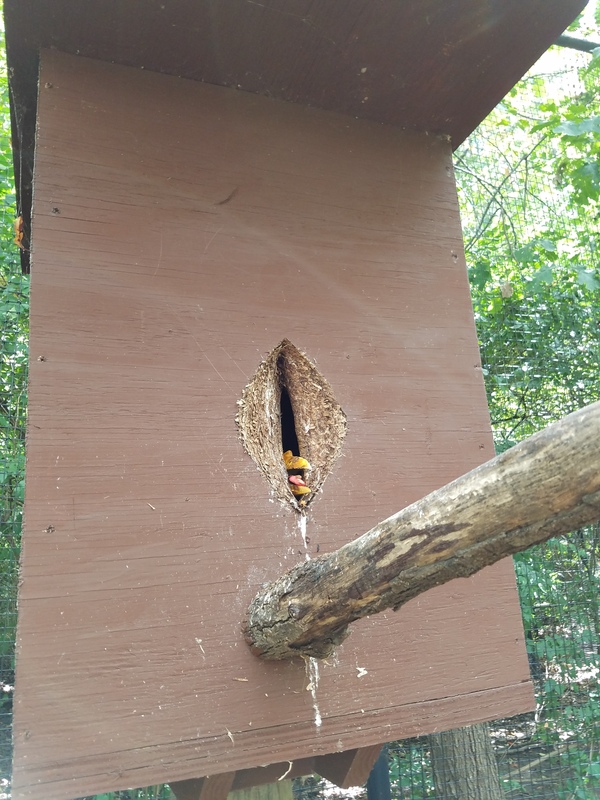 During nesting season, the female will seal herself inside of the nest box using wood shavings, sticky food, and feces. We made sure that the pair was provided with all the things that they need to be successful, such as adding foods like figs and boiled sweet potatoes to their diets to help them seal up the opening. Ayu worked on and off sealing the nest box for a couple of days before sealing herself in fully. 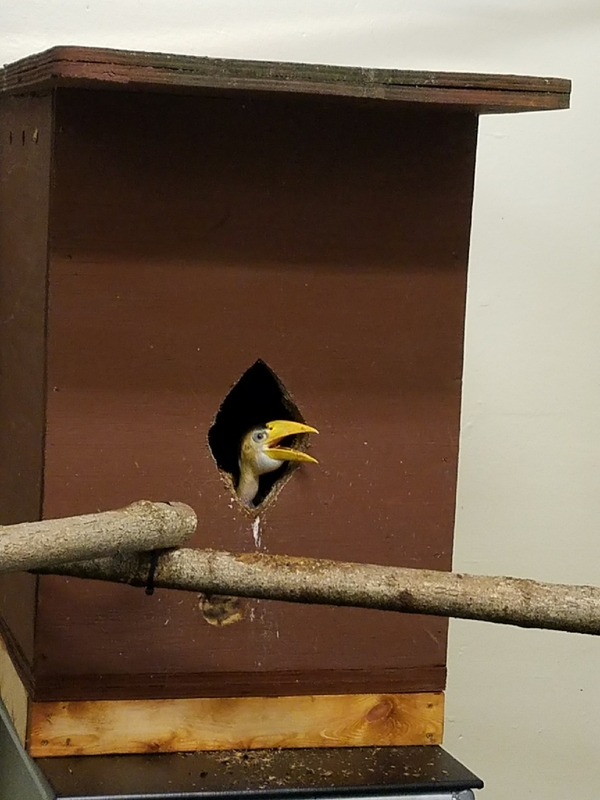 She does not leave the nest box until the nesting process is over, but she leaves a very small opening so that Bayu can feed her. The last time that Ayu was seen outside of the nest box was July 16th. Once inside and sealed, females can lay between one to three eggs and will incubate them for about 28 days until they hatch. They then remain inside the nest box with the chicks until they are strong enough to emerge. This could take another 60 to 80 days! 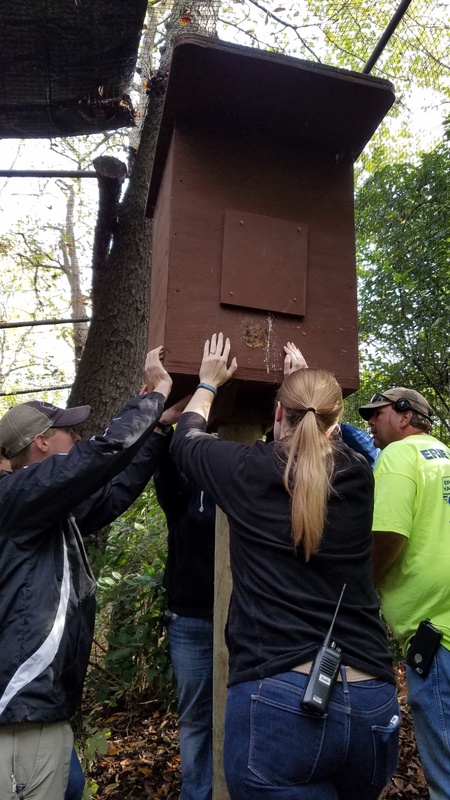 That means females stay inside their nest box for a total of around 90 days and throughout all this time the male is focused on feeding everyone in the nest box and protecting them from predators. 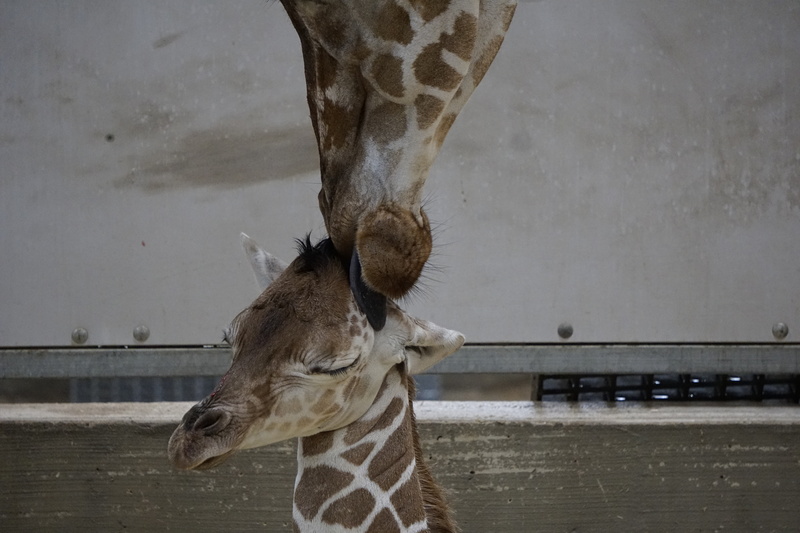 On August 24th, a keeper heard a small vocalization that could have been a chick. At that point, Ayu had been in the nest box for 39 days. It was confirmed in the following days that there was a chick that had hatched! We helped determine that a chick had hatched based on what foods Bayu was picking to feed Ayu. Chicks are usually fed higher protein items when they are young and when Bayu immediately started feeding Ayu mealworms and crickets we were pretty confident that we had a hornbill chick. Based on our timeline, we hoped that Ayu and the chick would break out of the nest box before the end of the season. Wrinkled Hornbills are native to Indonesia, and are very sensitive to the cold Indiana temperatures. As the temperatures started dropping, we began to worry about Bayu. Since he had to stay outside to feed Ayu, he was especially susceptible to the weather. After conferring with vet staff and keepers, it was finally decided to move the nest box (with the chick and mom still sealed tightly inside) indoors for the winter. 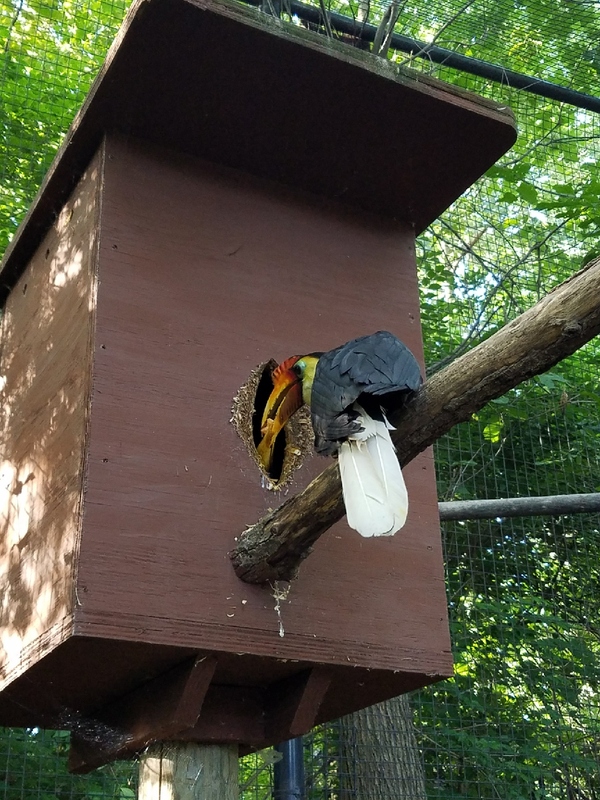 It was quite the process, but our team was able to safely relocate the heavy box inside so that the hornbills could be warm for the winter and emerge from the nest box when they were ready. 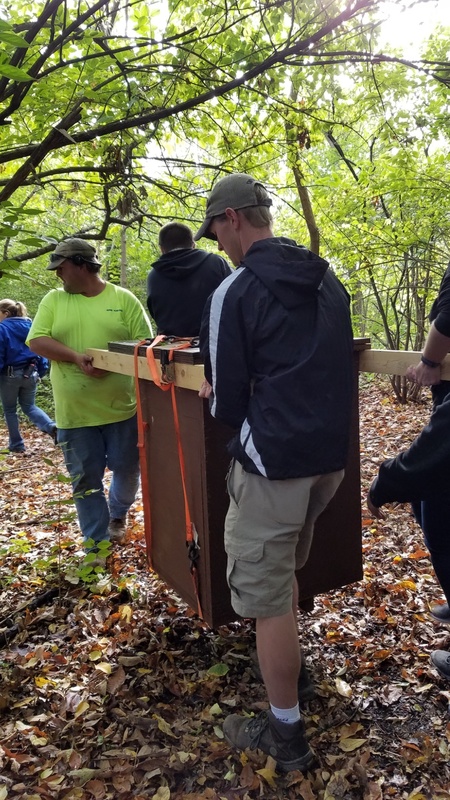 The nest box weighed several hundred pounds, but our team managed to carry it inside to safety! She was a little uncertain at first, but Nuri emerged from the box ready to fly! Though it was a long and tedious process to produce a single chick, it was well worth it. In fact, our chick Nuri was one of only two Wrinkled Hornbill chicks to successfully hatch this year in any zoo! This represents a huge achievement for their species, whose population is suffering in the wild. 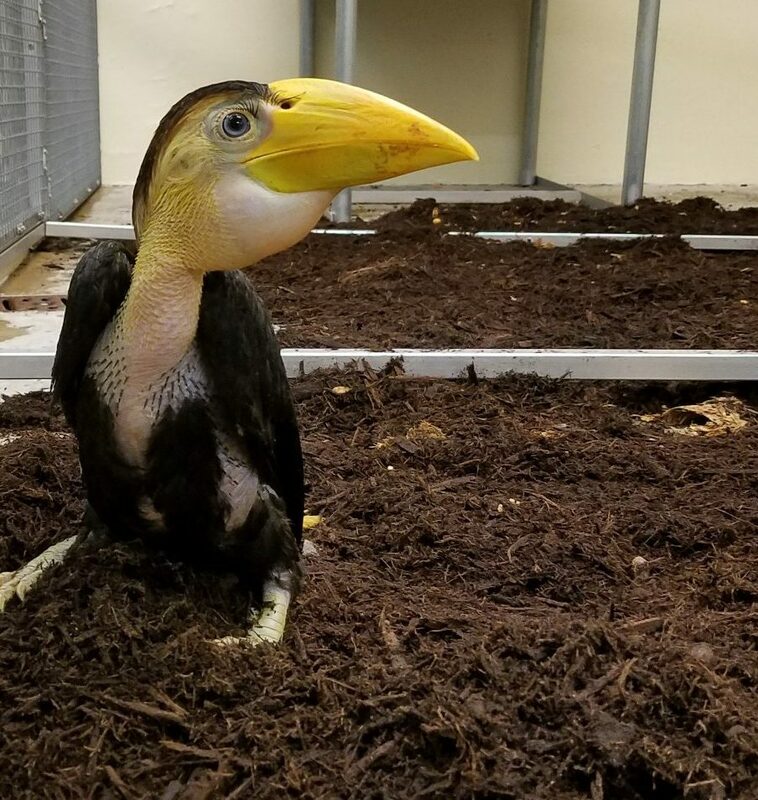 Because of our animal care team’s hard work, we are excited that we have made steps toward saving this endangered bird. 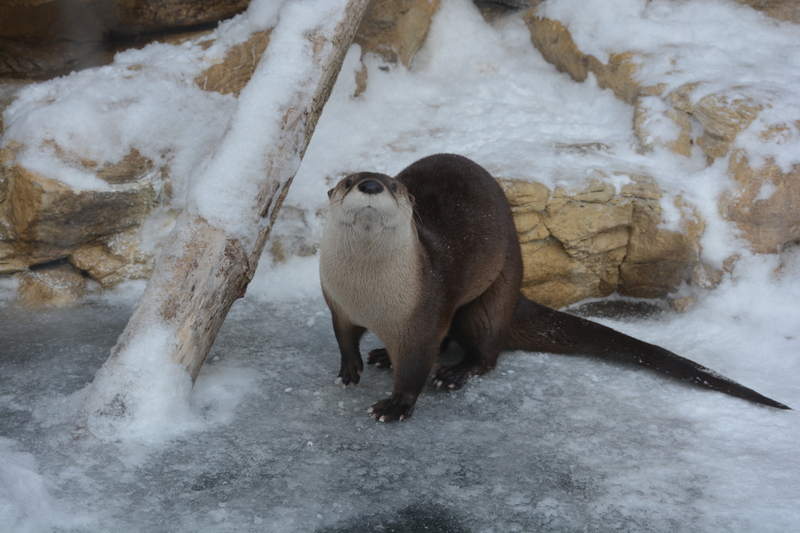 Snot otter. Lasagna lizard. Devil dog. Hellbender. 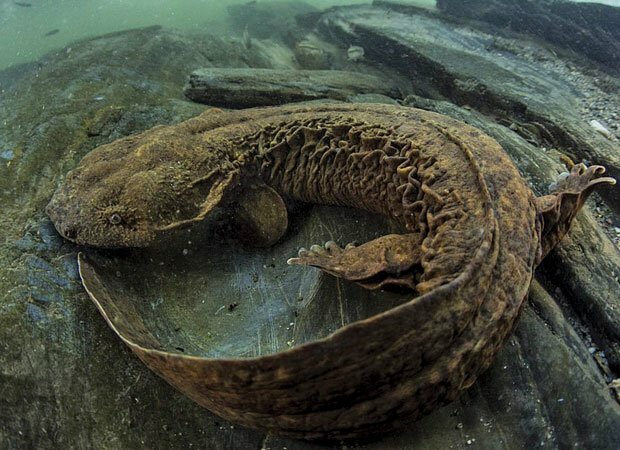 Whichever common name is used to describe North America’s largest salamander, unpleasant images come to mind. Most people have never heard of hellbenders- until I started working at the Zoo, I hadn’t either. This is probably because despite once being widespread across the Midwest, habitat loss and decreased water quality have driven the salamanders’ population down significantly. 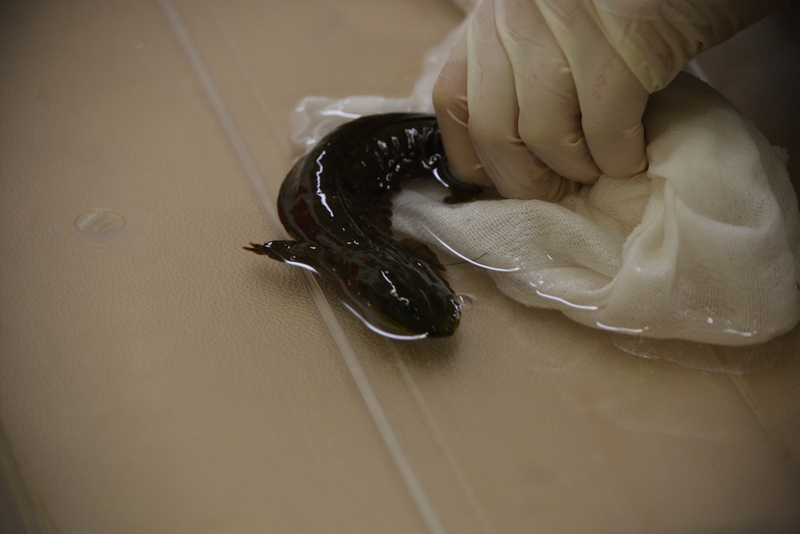 Less than a few hundred are left in the wild, and the Fort Wayne Children’s Zoo has partnered with Purdue University and Help the Hellbender to help save them. While some people might not think that saving giant salamanders is an important cause, the hellbenders are an indicator species, which means they help indicate the state of their ecosystem. Hellbenders actually absorb oxygen directly out of the water through its skin and into its lungs. Because they are sensitive to pollution and sediment in the water, they are biological indicators of water quality. 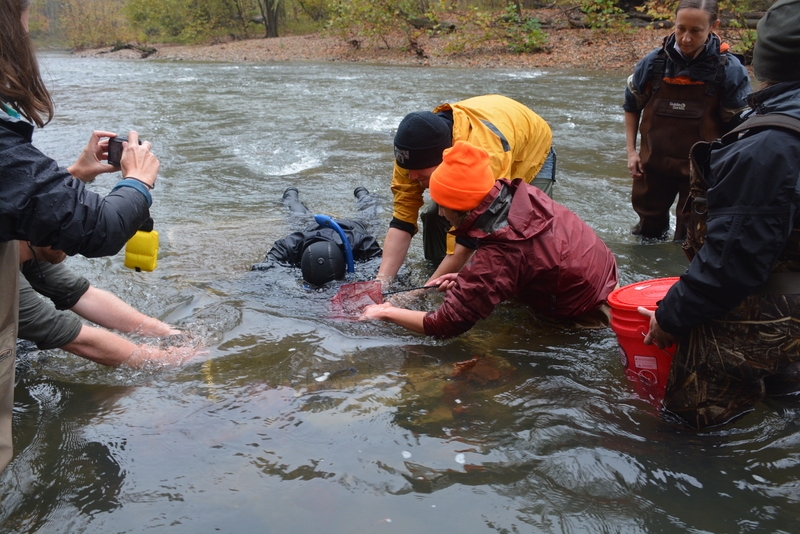 For the past four years, our staff has helped to “head-start” approximately 60 hellbenders. Because they face so many challenges and have a low chance of survival if they are left to hatch in the river on their own, we raise them from a young age until they are big enough to return to the river. By doing this, we hope to reduce the chances of them being eaten by their many natural predators. Once the hellbenders are big enough (usually around 4 years old), we take them to the river and release them! Although this may sound easy, there’s a catch: there is currently only a single river in Indiana that is suitable for hellbenders to survive. That means only one river in the entire state is clean enough for them to thrive in. 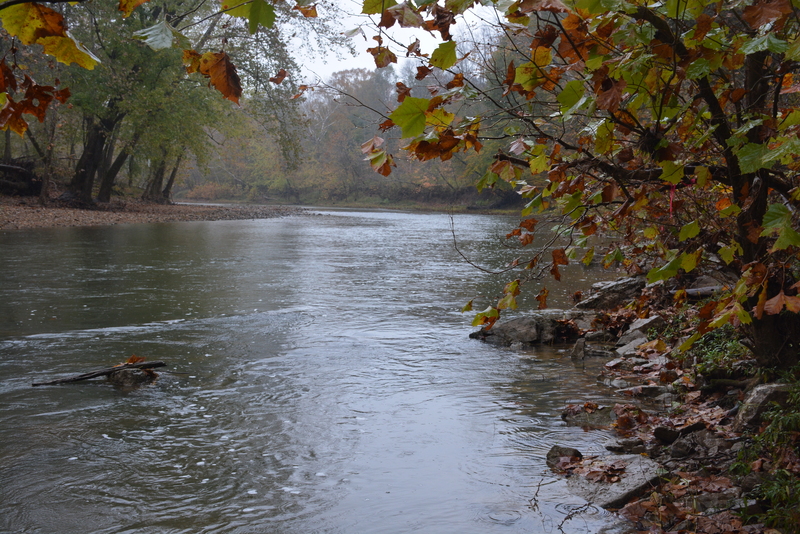 And that river happens to be four hours away from the Fort Wayne Children’s Zoo. 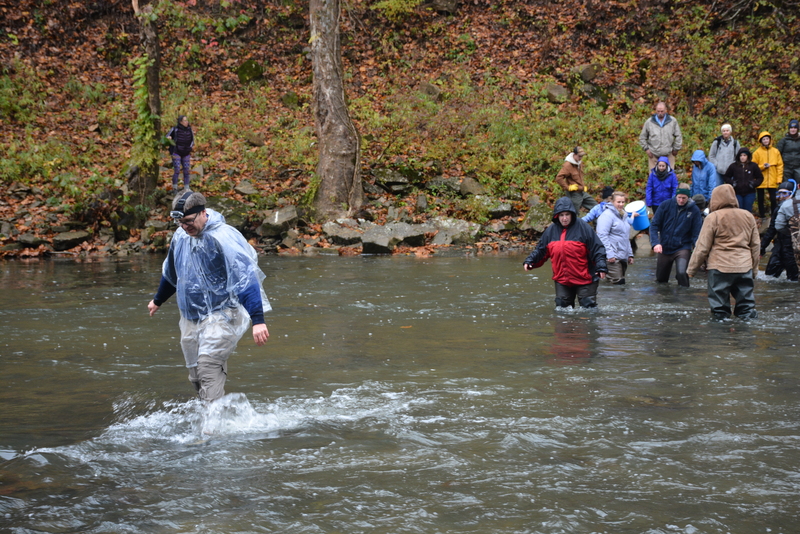 Despite this, on November 1st three Zoo employees bundled up and made the long drive south to help release hellbenders into the Blue River. This day was years in the making, and was extra special as it marked the very first release ever done with eggs found in the Blue River. 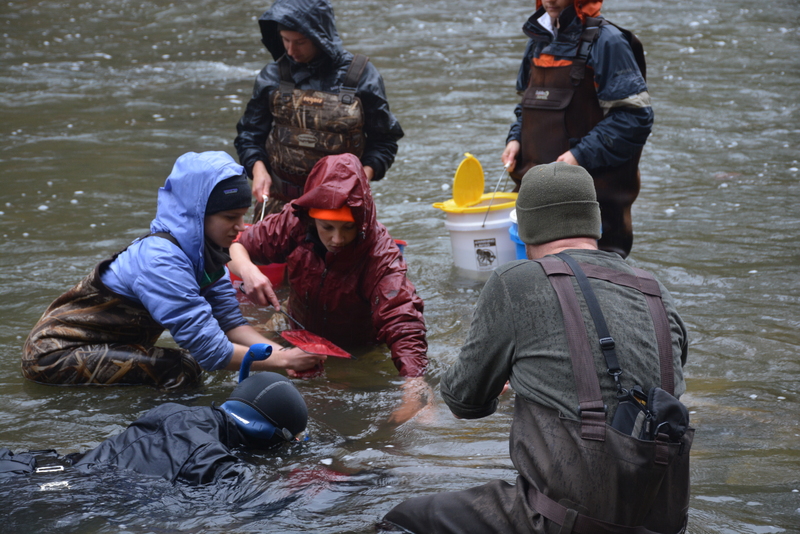 Even though it was 45 degrees and pouring down rain, everyone was so excited to be a part of such a monumental step toward saving the hellbenders that we didn’t mind (that much). It was a motley group of people that arrived at the muddy riverbank to help with the release; some zoo keepers, several Purdue students, our veterinarian Dr. Kami Fox, Dave Messmann, our resident hellbender expert, and myself, the Social Media Coordinator (it was clear immediately that I was out of my element as we trudged through the mud down to the river and proceeded to wade into the thigh-deep cold river and I attempted to not drop the camera into the fast-moving current). By the end of the day, 40 hellbenders were released back into the river that they came from, which was a huge accomplishment! Everyone got to release one, and after seeing them up close even I had to admit these “devil dogs” are pretty cute. 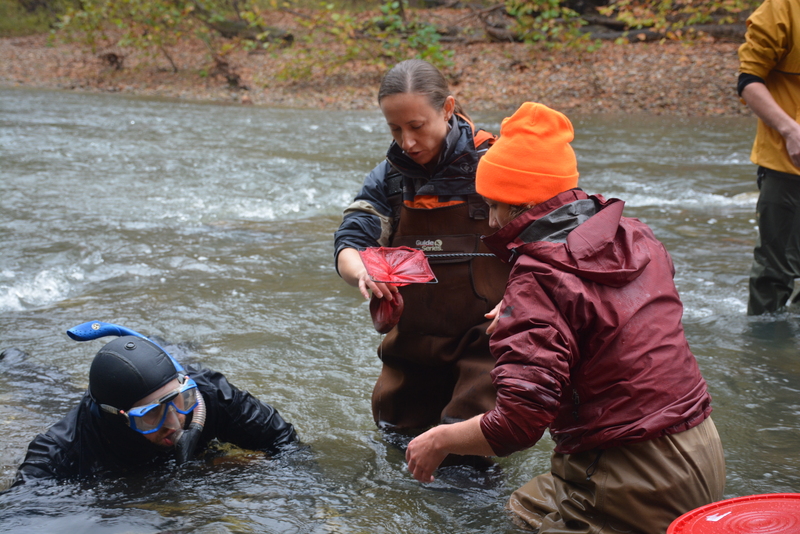 Each hellbender released was equipped with a radio transmitter, so that we can collect future data on the hellbenders’ whereabouts and survival success. Next year, the hellbenders we have been raising will likely be ready for release, and we will be able to repeat the process with the salamanders we have been working with for over three years. There are a couple of subspecies of hellbenders (we have Easterns), but all of them are suffering. Even though the hellbenders aren’t something you can see on exhibit at our Zoo, it’s an important project. 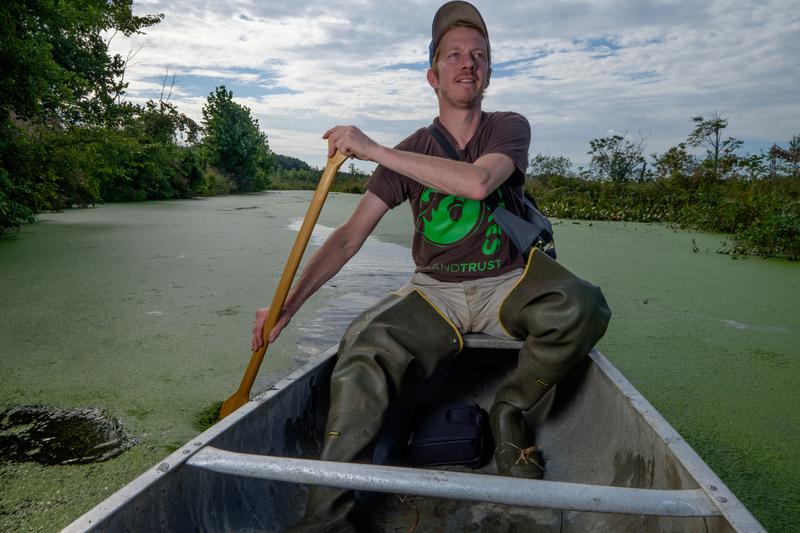 Employees like Dave have dedicated countless hours to ensure that our hellbenders are cared for properly so that one day we can rebuild a strong population in the wild. Not everyone can go wade in a river and help release them like we did, but you can do something. 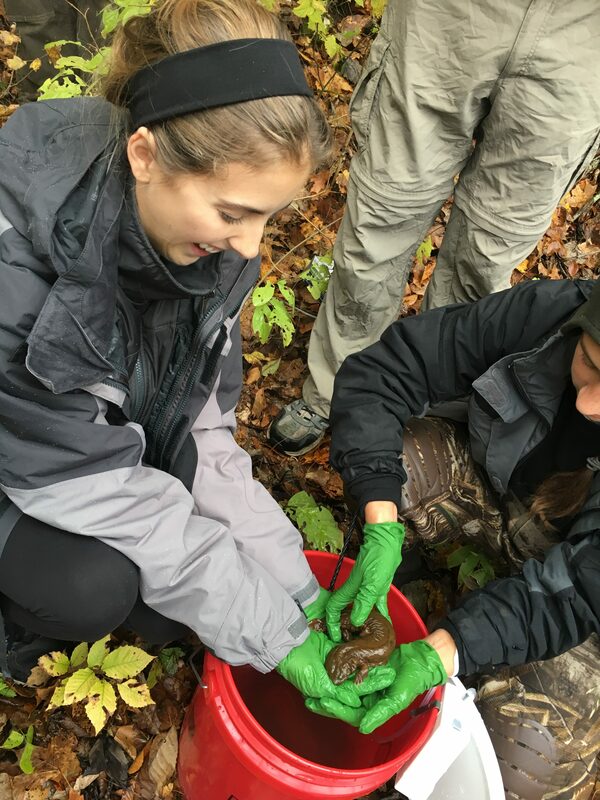 Check out helpthehellbender.org to learn more about this amazing project and find out how you can help the hellbenders too! Even though it was raining, it was still beautiful! Dave’s poncho might have saved him from the rain, but not the freezing cold river he was wading in! 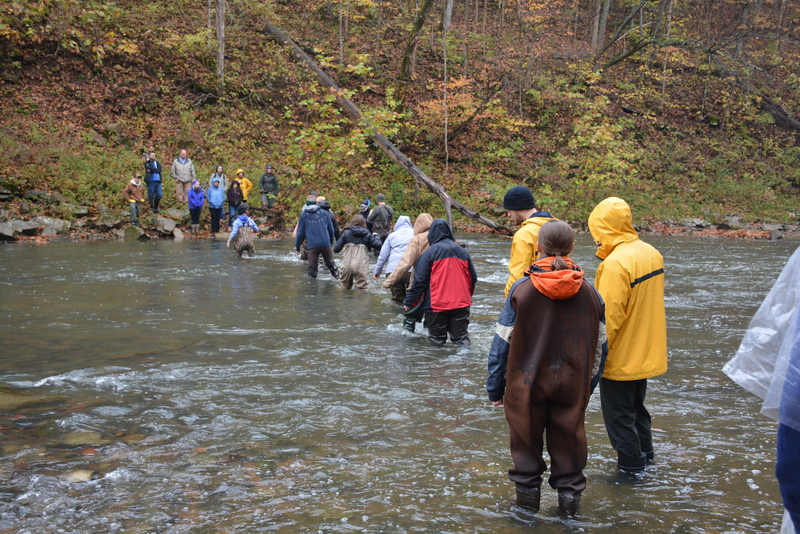 It takes a village for a successful hellbender release! They may be squirmy and slimy, but hellbenders are also cute! 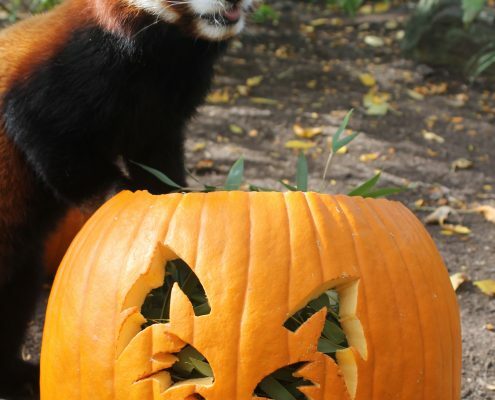 If you were at the Zoo last Saturday, you probably saw lots of animals with pumpkins in their exhibits. 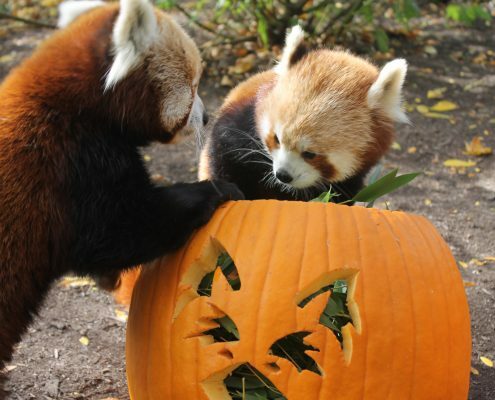 While this is adorable in itself, there is a purpose for the pumpkins besides just providing cute photos! 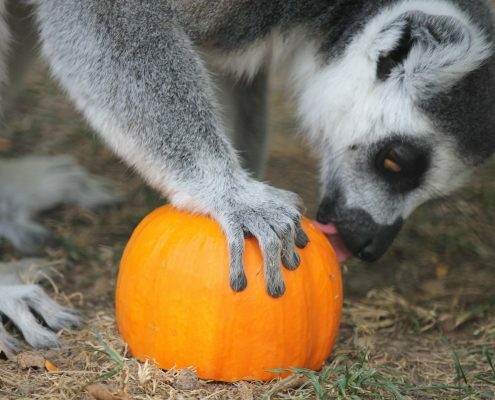 Pumpkins were actually given as a form of enrichment, which are activities or challenges we give our animals to encourage behaviors they would naturally exhibit in the wild. Animals all over the Zoo were given pumpkins filled with treats or other Halloween-themed enrichment, all aimed to encourage their natural behaviors and allow keepers to educate guests about the enrichment process. 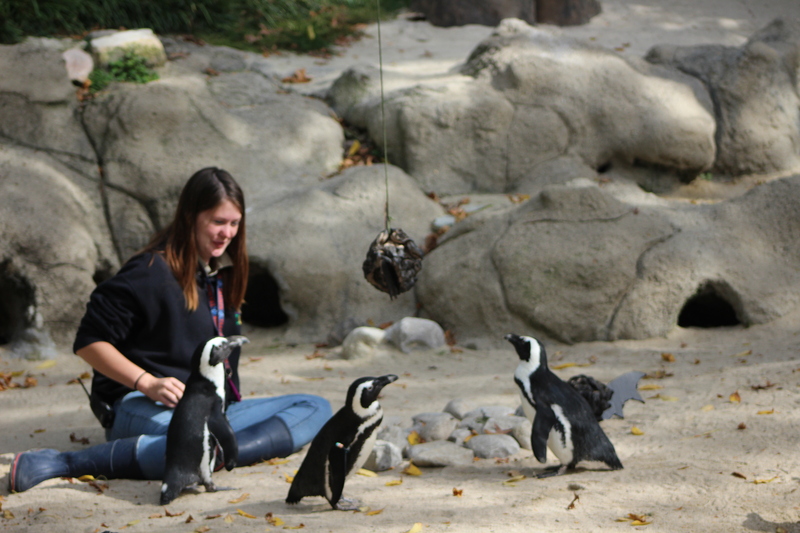 This year, Britni Plummer (Zoo Keeper, Aquatics) helped to provide enrichment for many of our animals. Every animal receives something different, depending on their individual needs. 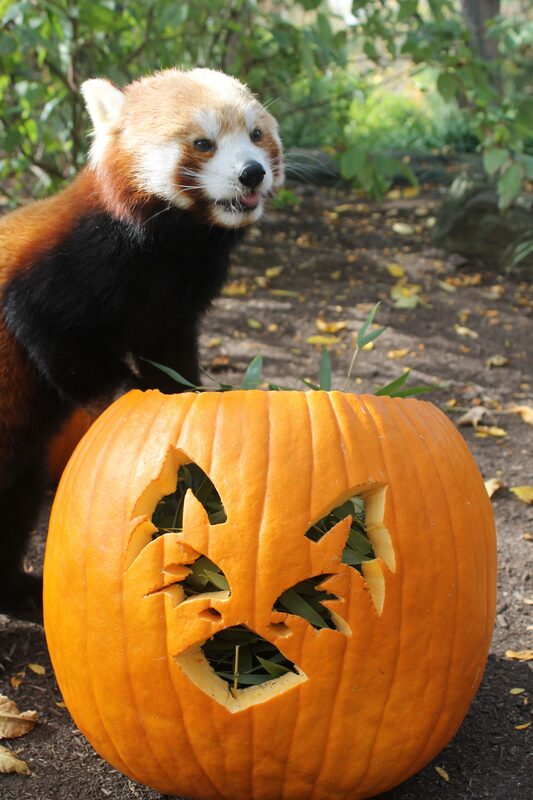 For instance, the dingoes were given ghosts and pumpkins to encourage their hunting instincts, and our red pandas received bamboo-stuffed pumpkins to encourage foraging. 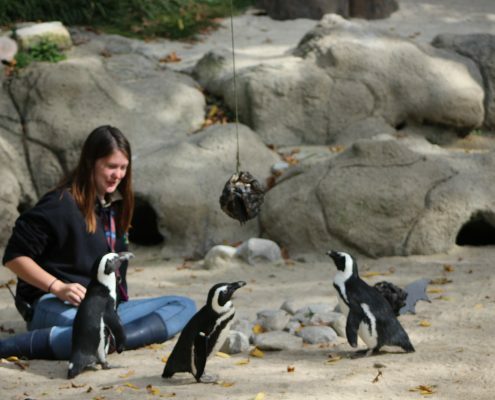 “For penguins, keepers made hanging bats out of cardboard and paper towels. 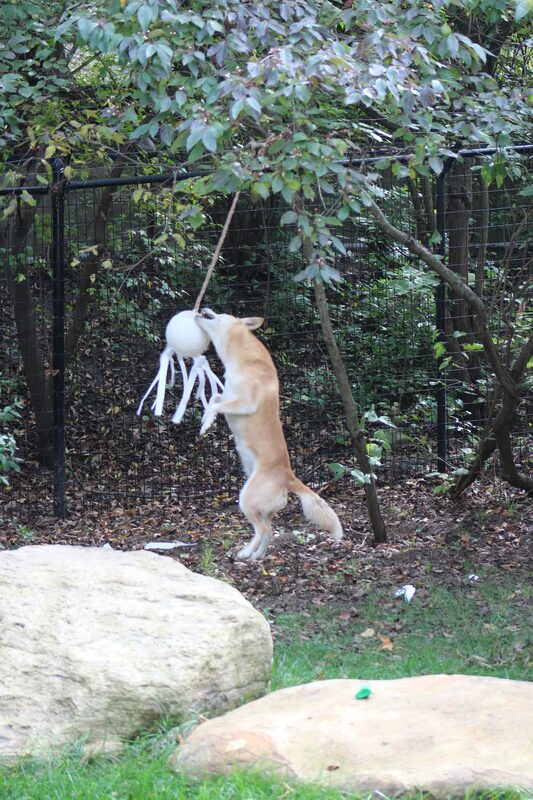 This was to encourage their natural curiosity and chasing behaviors. They were a little skeptical at first, but they love to peck at and chase things that swing and move. 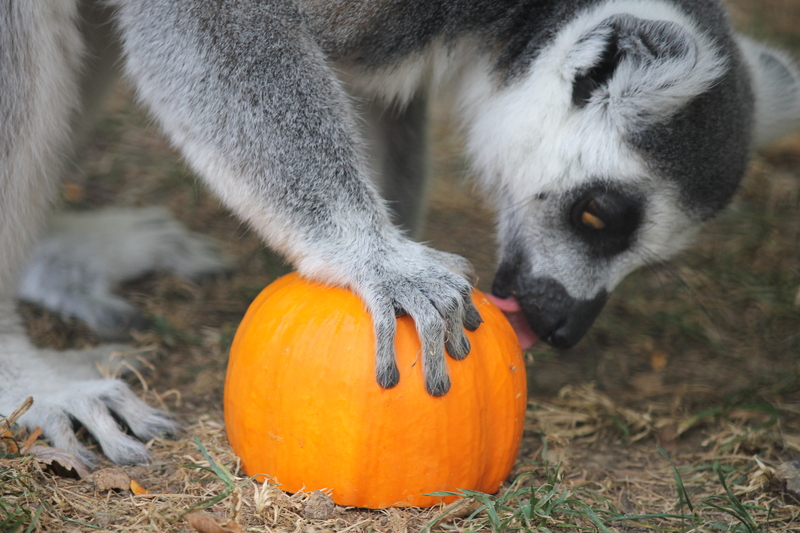 With our sea lions, we wanted to encourage a natural foraging behavior so we hid frozen fish inside of small pumpkins. The sea lions had to push the pumpkins around or toss them in the air in order to get the fish out.” While sea lions don’t encounter pumpkins in the wild, this gave them a challenge and forced them to think creatively to get to their fish! 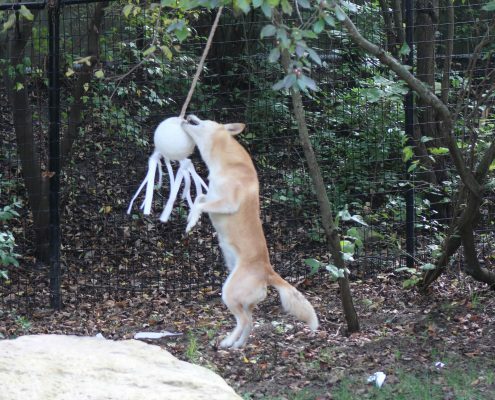 While we offer enrichment throughout the entire year, it’s always fun to do themed enrichment around the holidays for both the animals and the keepers (a little zookeeper enrichment, if you will). After all, who doesn’t love pumpkins? 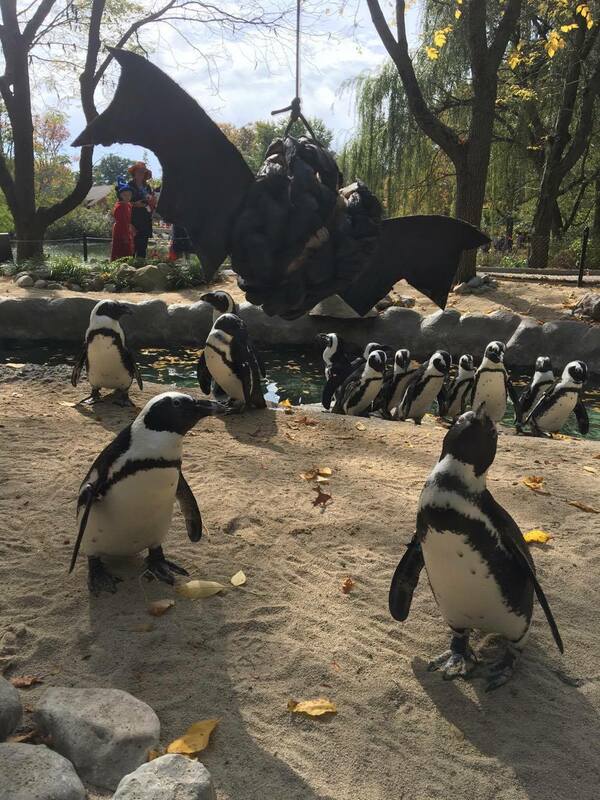 So this bat was exciting for them, once they warmed up to it! 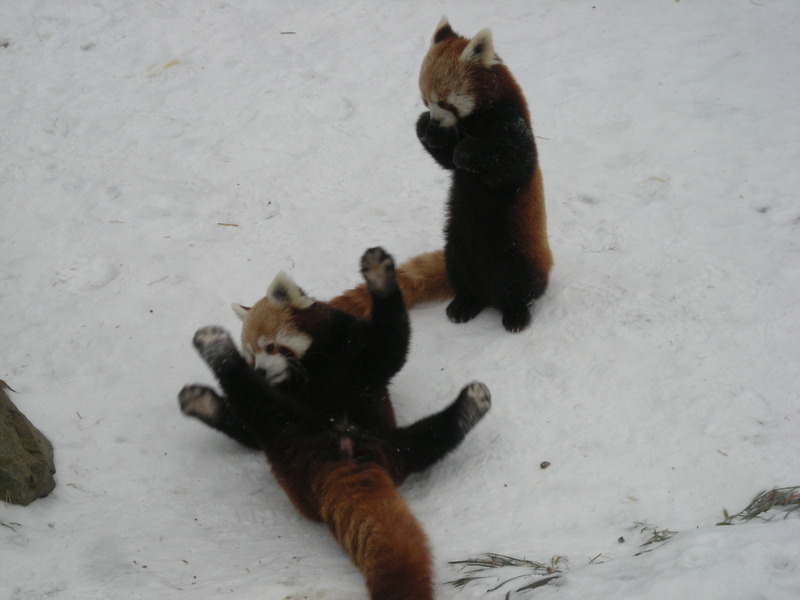 What’s cuter than our red pandas Xiao and Mars? 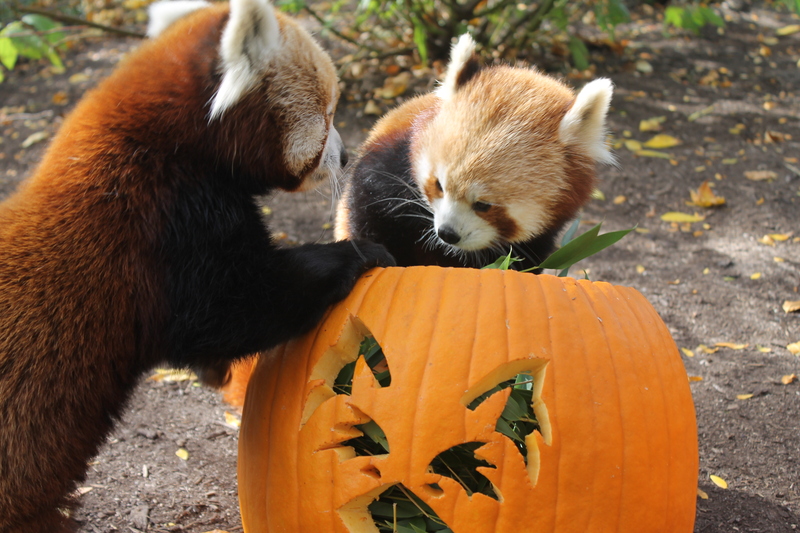 Our red pandas with their special red panda carved pumpkin! 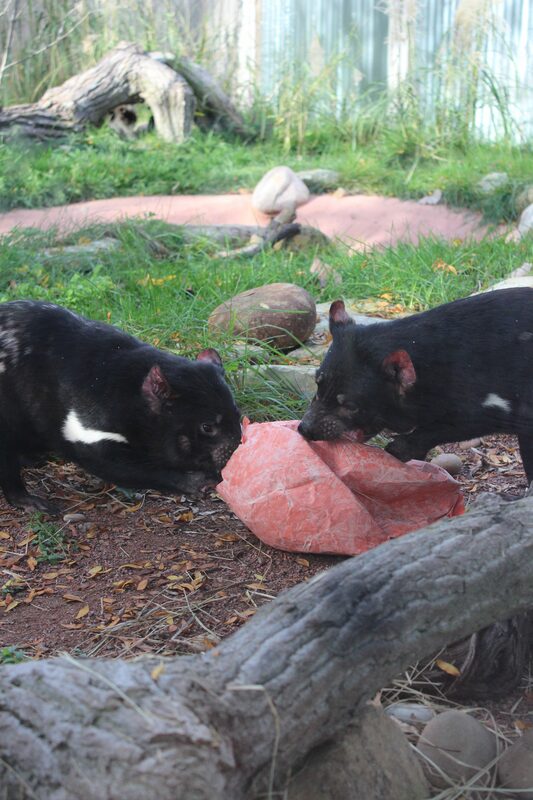 Even the Tasmanian Devils got in on the pumpkin action! 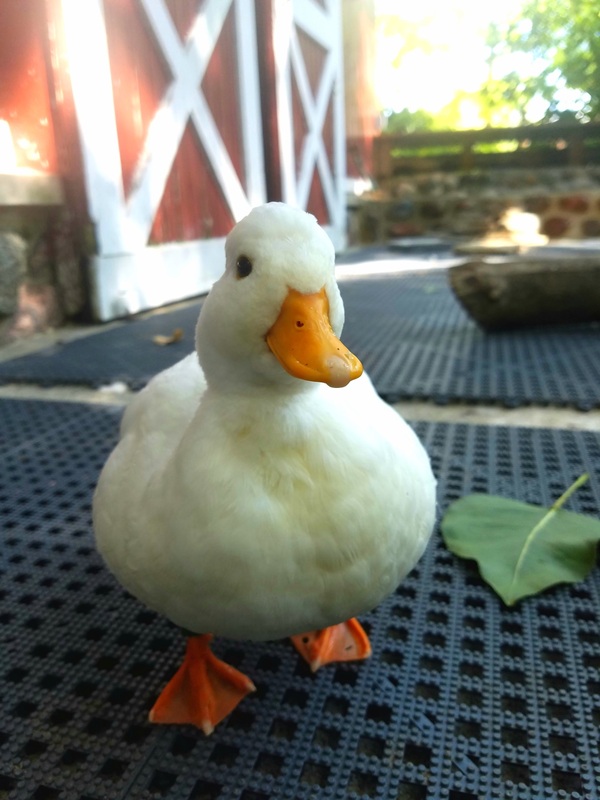 Three call duck clutch mates, named Sheldon, Howard, and Leonard, arrived at the zoo in April of 2014. They were wary of keepers and unsure of their new environment. A need for training was established and positive relationship building began immediately. Before training could begin, it was necessary to get the ducks more comfortable with the keepers and to get them to accept food from keepers. 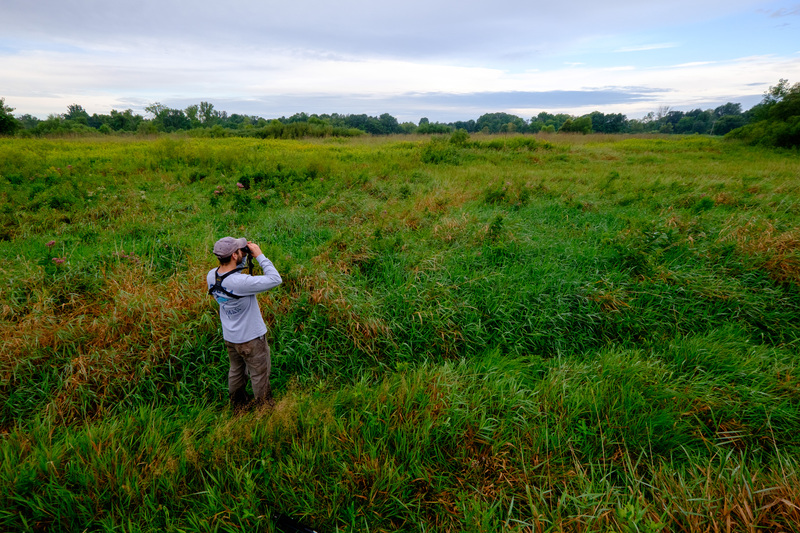 For months, all keepers who worked in the area would spend as much time as they could with the ducks to desensitize them to the keepers’ presence. 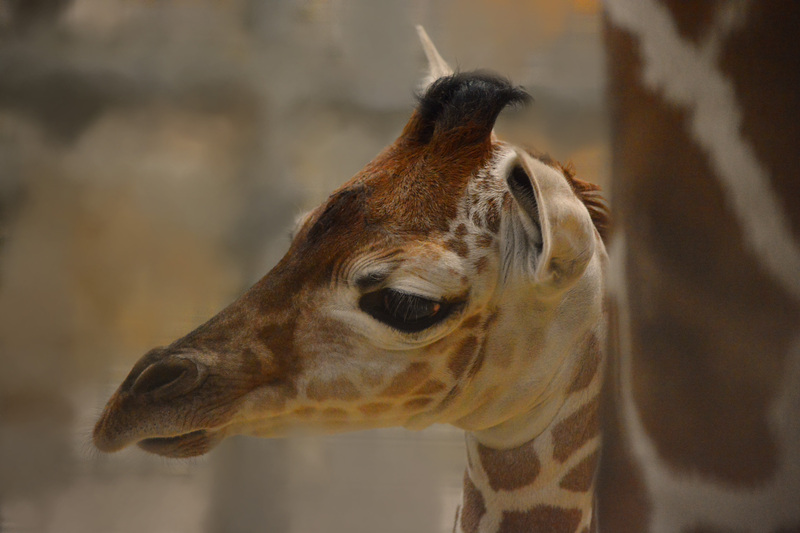 Pretty soon, they readily accepted food from the keepers’ hands and would anticipate the arrival of keepers by exiting the pool to approach them. Now that reinforcement could be delivered, the call duck training program began. Training all three ducks at once proved to be a challenge, so individual training was pursued instead. 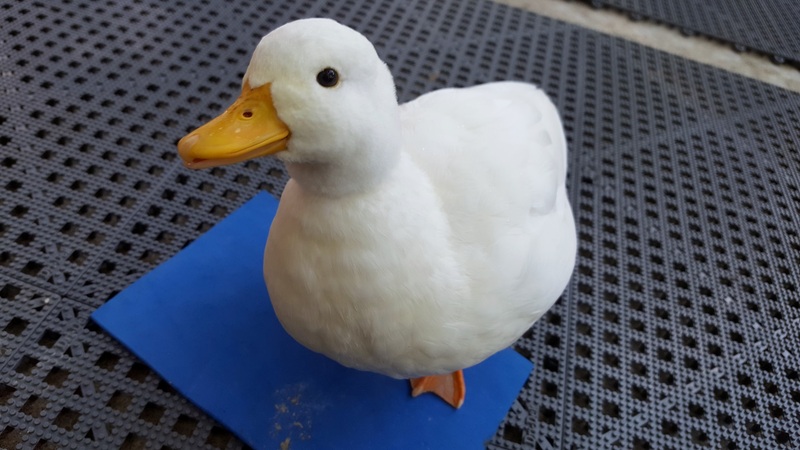 Target training- getting the ducks to respond only to their specific target (corresponding to a color) was the first behavior goal for the ducks. The trainers believed it would be the most useful tool as a base for training. Sheldon was the most dominant and food motivated individual at the time so training began with him. 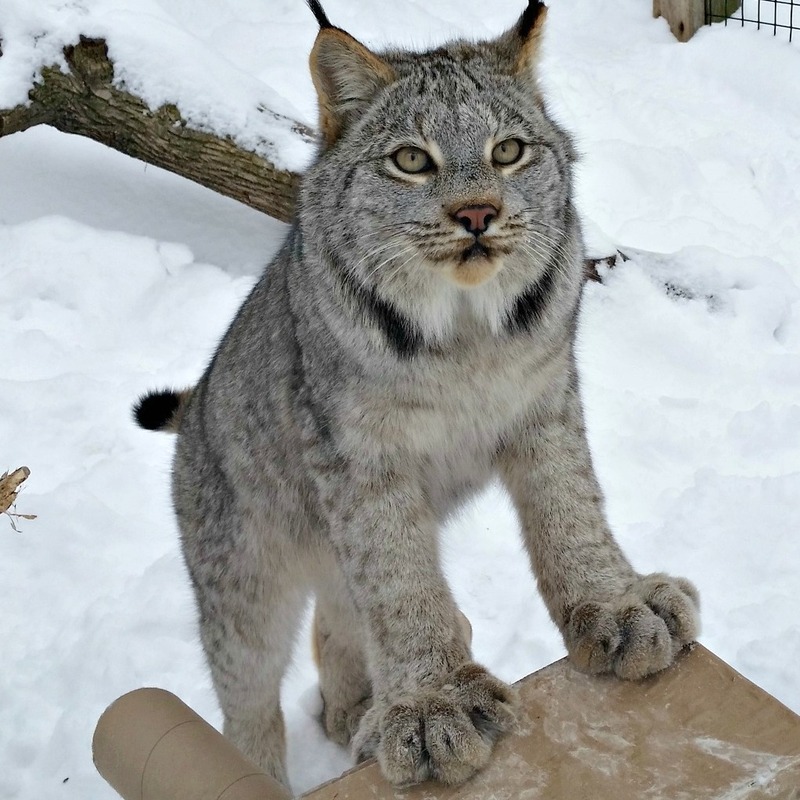 Sheldon was presented with the yellow target stick first. Through his natural curiosity, he pecked at it and caught on quickly that pecking the yellow stick led to a reward. Next he had to be taught that ignoring the red and blue targets led to a reward. The trainer presented the red or blue target then bridged and reinforced before Sheldon had a chance to peck it. Howard proved the second-most eager to participate, so he was trained next. Sheldon remained indifferent to a second participant, as long as he received target training in the same session. The process was repeated with Howard using the red target stick. Having already trained color discrimination with Sheldon, the trainer applied previously learned lessons. When Howard was introduced to the other targets, the trainer immediately reinforced for no reaction to yellow or blue. This made the process much smoother for this individual. Leonard was the least dominant individual and often displaced from food by his clutch mates. To build Leonard’s confidence, the other two individuals were targeted out of the pool and heavily reinforced on the ground so that Leonard could train in the pool. Leonard was presented with the blue stick and quickly caught on that pecking it lead to a reward. By the time Leonard was ready to learn color discrimination, the other two no longer had to be separated out of the pool. It then became apparent that no training had to be done for this step as Leonard already avoided the other two targets. 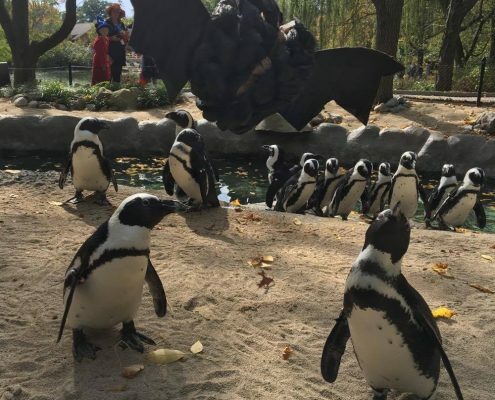 Target training became such a strong and well established behavior that every time the trainer would enter the duck enclosure, the ducks would excitedly crowd around the trainer and run around displacing each other for opportunities to train, even fighting occasionally. This was the basis for the decision to train a station behavior next because stationing would be incompatible with running around and fighting. 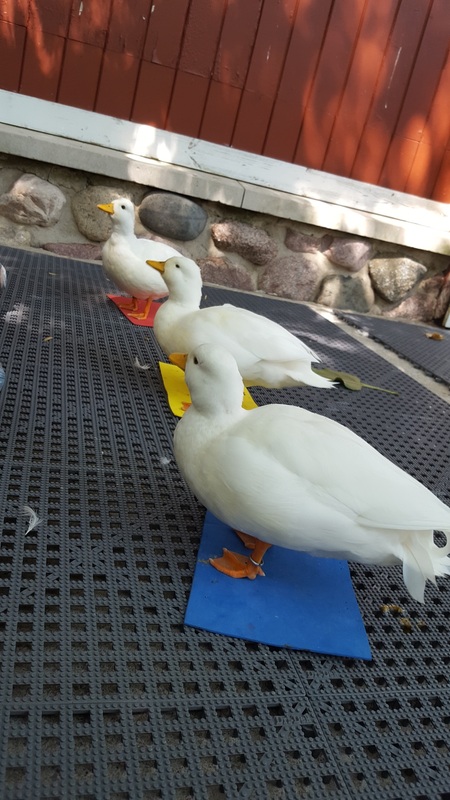 The criteria for the finished behavior would involve each duck calmly standing with both feet on their station mat. The station mats were color specific which matched to each individual’s target color. This mat could be moved throughout a session, and the duck would follow. All three ducks on their training mats! While the stations were successful in keeping the ducks in a relative location, they would not stay on station for any length of time. A change in approach for station training was adapted from our sea lion training team and solved the issue. The sea lions at our facility are only reinforced once they have returned to station after completing a desired behavior and are calm for the acceptance of reinforcement. When applied to the ducks, they would be targeted to a different area, but reinforcement was only given once they were back calmly waiting on their station. The call ducks are vastly more comfortable in keepers’ presence after completing their training. The ducks are no longer fearful of enrichment items presented by the keepers and readily investigate new things. 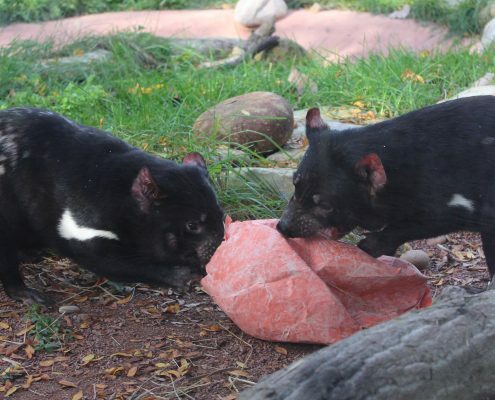 Keepers are able to observe their behaviors more easily and are able to determine the effectiveness of the enrichment towards eliciting natural behaviors. 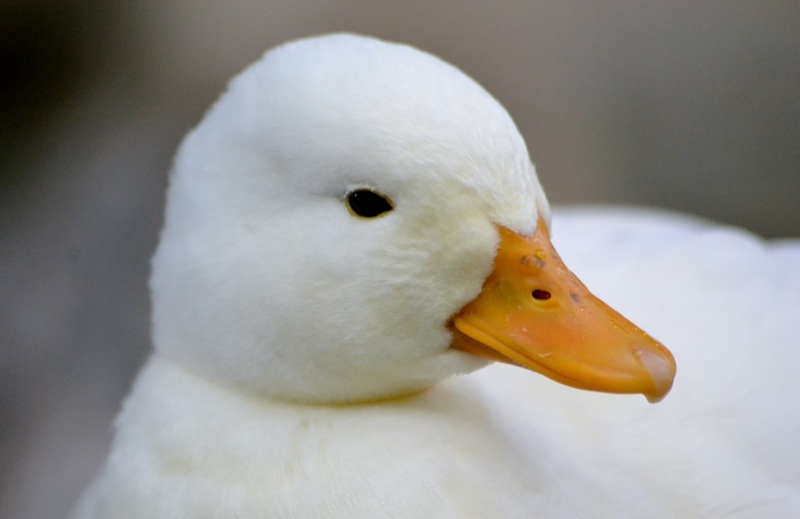 The ducks readily come out of their pool at night and shift into their indoor holding without the need of aversives. Monthly weights are recorded with no stress to the ducks at all. The lives of these three individual ducks have improved greatly since the initiation of their training program. 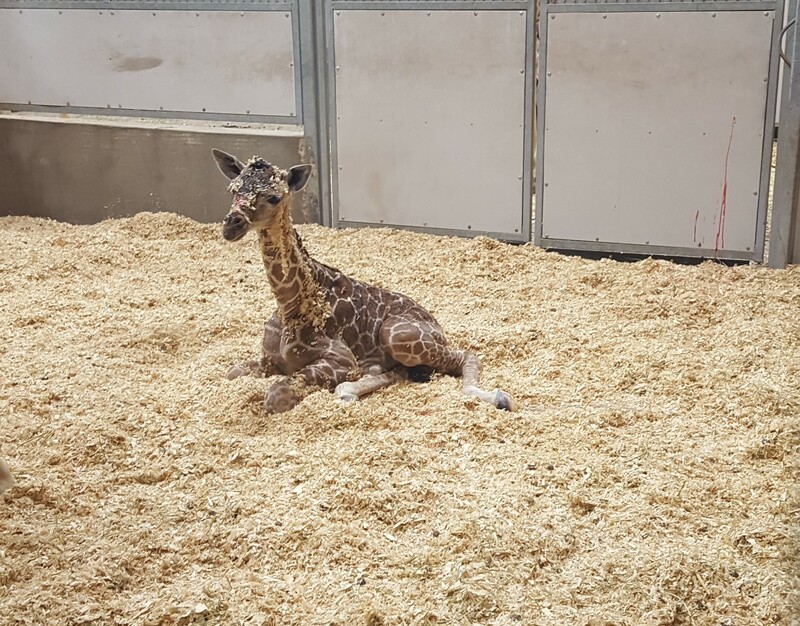 Giving the animals the choice to participate in their care has proved beneficial in improving the welfare for these individuals. Training these three small ducks has proved that every animal, no matter how big or how small, deserves a chance to have the choice and control in their environment. https://kidszoo.org/wp-content/uploads/2017/07/IMG_1082.jpg 1365 2048 Sarah Dove https://kidszoo.org/wp-content/uploads/2015/03/zoo_icon.png Sarah Dove2017-07-03 14:14:272017-07-05 15:20:15Who's Toba?